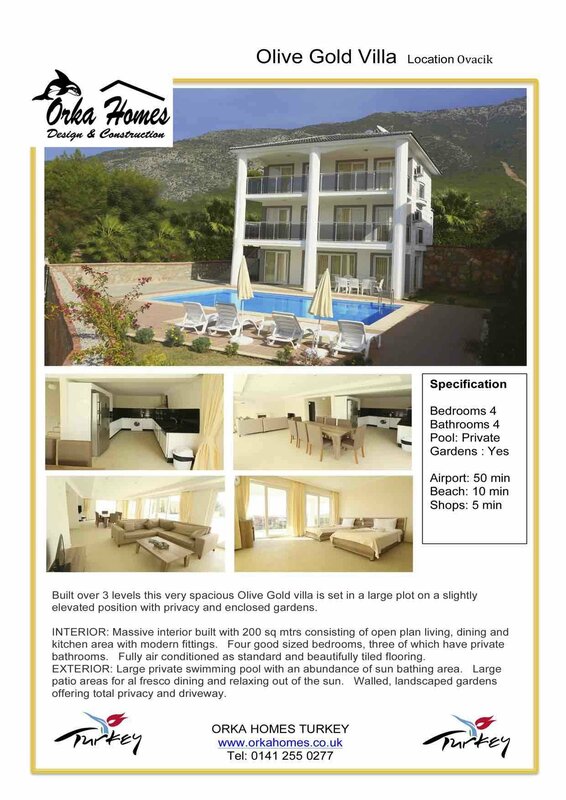 Modern Fethiye villas for sale built over three levels with large open plan living area on ground floor overlooking the pool and upstairs you will find 4 large bedrooms with en-suite bathrooms. This villa comes fully furnished. Ground Floor: Open plan lounge / kitchen and dining area with modern fitted kitchen. Corner fireplace for log burners in the winter and downstairs toilet and cloakroom. Double patio windows lead you out to the private swimming pool and garden area. At the front of the property there is also a private driveway and landscaped front garden area. Upper Levels: On the second and third floors you will find two large double bedrooms each with en-suite bathrooms and patio windows leading out onto a large shared terrace on each floor. 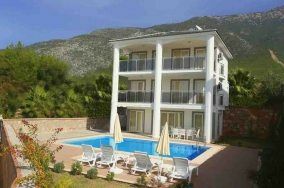 The location of the villa is excellent with the local shops, bars and restaurants only a 5 minute walk away and the city of Fethiye just a 10 min bus trip away. Local buses pass on the main road every 5 minutes.